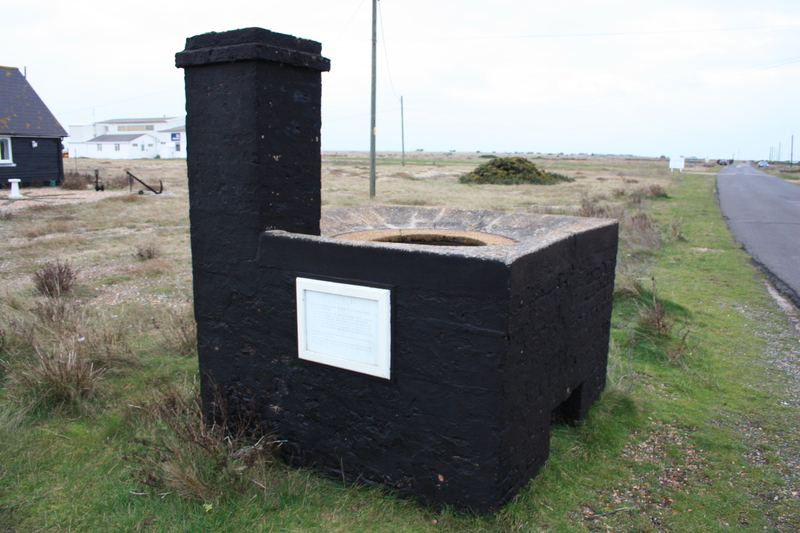 Dungeness is Britain’s only desert. It seems strange to have a desert in the UK, particularly one that lies on the coast and which is also surrounded by man-made lakes. But Dungeness is, officially, a desert. 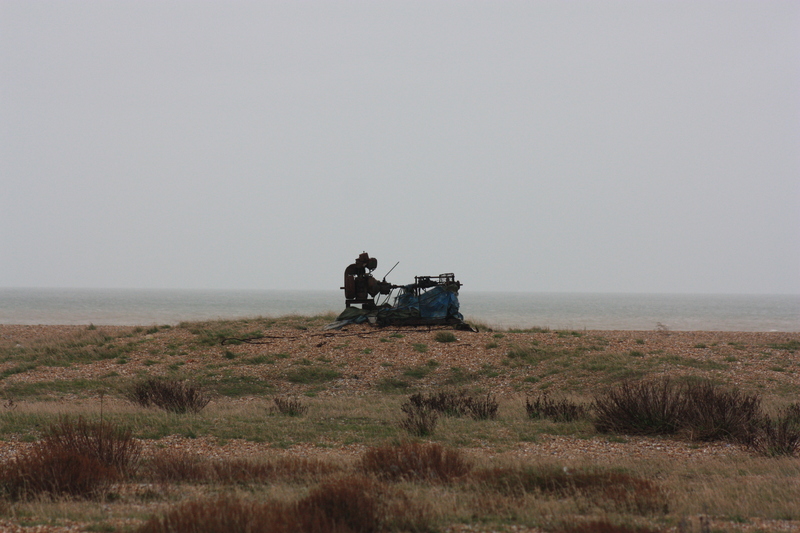 It is said that it does not rain much in Dungeness. It rained for us. It is certainly barren, and at this time of year, when overcast, it is also quite bleak. Yet it still holds a certain mystique and beauty. The houses there seem almost home-made, pitched erratically amongst run-down sheds, boats and bits of unidentifiable machinery. 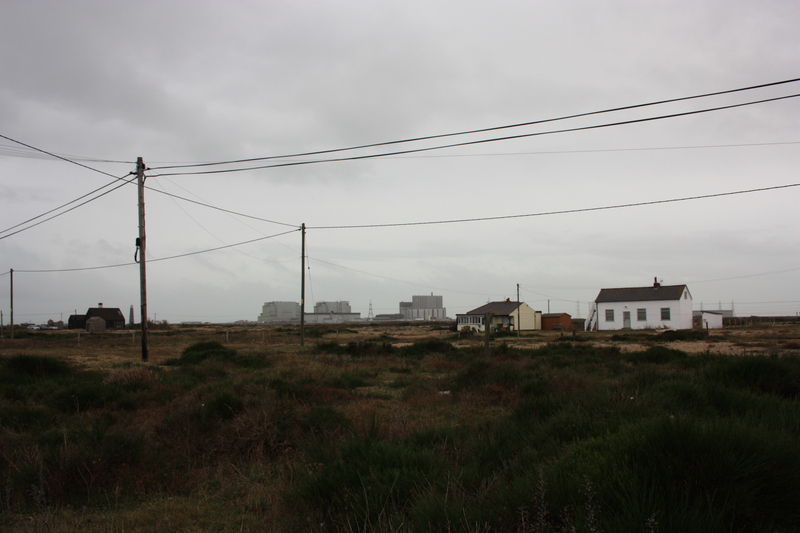 Dungeness is Europe’s largest stretch of shingle landscape. It is 6,000 years old, and its unique landscape means it supports many uncommon plant and animal species. The RSPB nature reserve, created here in 1931, is Britain’s oldest. But the thing Dungeness is probably best known for it its nuclear power station. It is a strange place indeed. On the road in we came across a tanning copper. In days gone by, these were used for dying fishing nets and clothing. Big circular copper tubes were filled with water, and a fire lit underneath them. A lump of kutch, plant resin from Burma, was put in a basket above the water, and slowly dissolved. The water was stained to a dark brown, and then nets and clothes soaked in it to preserve them against the ravages of the sea. The nets would be used only once, and then re-soaked. This particular tanning copper dates back to 1910. We walked into Dungeness. The houses stood haphazardly, trying not to interfere with the telephone cables that criss-crossed back and forth around them. Ever present in the background was the power station. We finished our walk at a Dungeness layby. We knew that mobile signals were virtually non-existent here. Further, as it was Boxing Day, we also knew that getting a taxi might be a problem. For that reason, we had been incredibly clever, bringing two cars down with us. My wife parked in Dungeness, and then we all piled into my car and drove to the start of the walk at Littlestone, six miles to the north. This way, we would walk to Dungeness, and we could then get into my wife’s car and drive back to mine. Simple. We were so very cleverly prepared. As we ended the walk, approximately 200 feet away from her car, my wife looked at me. She had one of those “You’ll never guess what I’ve done” looks on her face. Rain was forecast any minute. The clouds were already rolling in and thickening up. “Erm…I think I’ve left my car keys in your car,” she said. I had one bar of signal on my mobile. I tried the only taxi number I had. No answer. I tried the internet. No signal. We walked to Deb’s car and discussed matters. There seemed to be no option but for me to walk the six miles back to retrieve my car as quickly as I could. I would try to be as quick as possible, and I would try to hitch a lift as I walked. The others were going to have to get wet, but it would be quicker if I walked back on my own. Agreement reached, I set out. I had walked one step, literally one step, when I saw a car approach. I stepped out in the road and flagged it down. I explained to the couple inside that we had left our keys back in Littlestone, 6 miles away, and asked if they happened to be going that way. If so, could I please ask them for a lift? It just so happened they were going that way. What luck! I jumped in. “Where would you like to go?” they asked. Anywhere would do I said, not wanting to put them out. But they insisted. I told them I was parked in Madeira Road, but that really, anywhere would do. Astonishingly, they lived in Madeira Road; that was exactly where they were going! And so it was that a potential disaster turned into an extremely lucky set of circumstances, due to the kindness of two people who took a complete stranger into their car and drove him six miles to his. They dropped me off about five meters away from my car. I do not know their names, but am very grateful to them. I got back to the others just as it started to rain. Safe and dry, we set off home. This entry was posted in Kent and tagged coast, desert, Dungeness, Kent, luck, tanning copper, travel, walking. Bookmark the permalink. Also, walking does seem to present unlooked for opportunities to experience the kindness of strangers, doesn’t it? I don’t know if years of living in London have just made me deeply cynical but I’m always (delightedly) surprised when strangers turn out to be kind, And many are, it appears. As I also live in London I know exactly what you mean! Wonderful story! Thanks for starting my week off with a smile. I hope you bought a lottery ticket when you got home!